These classic tacos contain lean ground beef, refried beans, and a variety of seasonings. The taco mixture makes a delicious filling for taco shells. Another way to enjoy the filling mixture and garnishes is on nachos. Make a big platter of nachos with the ground beef and refried beans along with lots of shredded cheese and your favorite garnishes. 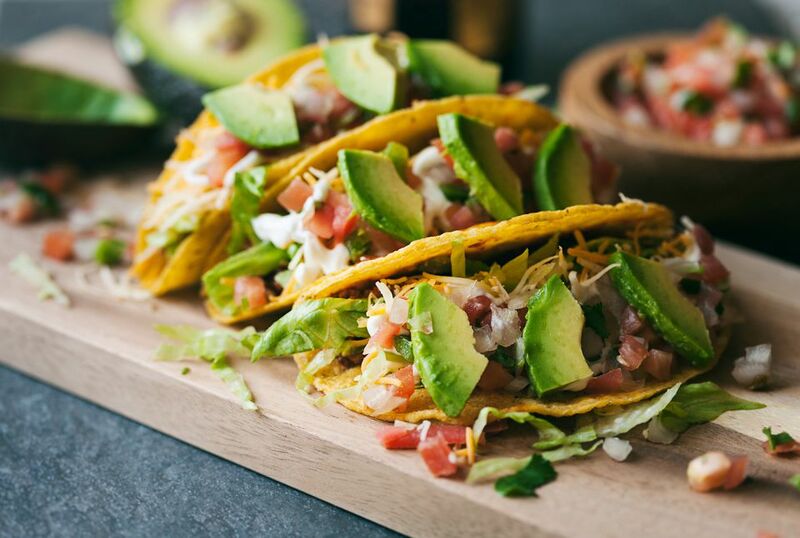 If you're counting carbs, turn these tacos into a hearty supper salad! Serve the ground beef mixture on lettuce leaves with shredded cheese, diced tomatoes, and sour cream. Add salsa and avocado wedges if you'd like. Put the ground beef in a large skillet over medium-low heat and break it up with a wooden spoon. Add the chopped onions and the red or green bell pepper, if using. Stir in the chili powder, salt, and garlic powder. Continue cooking, stirring, until the beef is no longer pink. Drain off excess fat. Add the refried beans to the beef mixture and use the wooden spoon to blend well. Stir in about half of the taco sauce. Spoon ground beef mixture into the taco shells. Top each taco with shredded cheese, shredded lettuce, tomatoes, and sour cream, if desired. Sprinkle each taco with more taco sauce or pass it at the table. Serve the tacos with easy Mexican rice and avocado wedges. Replace the ground beef with ground turkey or ground chicken. Use ground turkey or chicken thighs or half white meat and half dark meat for best flavor and texture. Part or all lean ground pork may be used in the tacos.